This installment in our series of deadly sins speaks to gluttony, and it's important to know how it differs from greed. The two are related, but greed is more of a miserly, selfish sin. You hoard. You acquire. You amass wealth. Gluttony, that's a different animal. Fundamentally, it's all about self-control, or the lack of it. You eat more than you should. Drink more. Spend more. Want more. Waste more. And as you are about to see, gluttony can also keep you poor. Let's start with the most obvious place that you're losing money, and that's on food and drink. If you are a real glutton, you're going to be spending a huge portion of your income on what goes in the fridge and the pantry. Food, food, glorious food, but, way too much of it. From overloading the cart when you go to the grocery store, to eating the whole pizza when a quarter of it would have been fine, your indulgence in food and drink is costing you big bucks. One of the best ways to deal with this is to limit portion sizes by using smaller plates, and to shop using a list of only the items needed. Also, don't go back for seconds when you can save that food and have it as a meal the day after. Directly related to eating and drinking too much is health care costs. It's widely-known that the costs for treating obesity in this country are staggering. Medical costs alone come to over $192 billion in the U.S. alone, and that is only continuing to rise. When you're obese, or just overweight, you are increasing the risk of getting many diseases and conditions, including: high blood pressure, high cholesterol, type 2 diabetes, coronary heart disease, stroke, sleep apnea, some cancers, depression, gallbladder disease, osteoarthritis, and body aches and pains. While some conditions are more serious than others, if you get them, you're talking about paying for doctor's office visits, hospital stays, medications, and therapy (both physical and mental). As the cost of health care skyrockets, you do not want to be paying more and more every year because you lack self-control. It's not always easy to hold back, and diets are no fun. But the alternatives are not just expensive, they can be deadly. A new phrase entered our vocabularies over the last few years: "binge-watching." It is the TV equivalent of eating an entire pizza in one sitting, and although it may not be as bad for your health as that kind of gluttonous act, it's also not doing you any favors. Sure, bingeing the occasional show every now and then is fine. But if you find yourself bingeing series after series, week after week, you are spending way too much time in front of the TV. This leads to "checking out" of more healthy activities, like hiking, cycling, swimming, gardening, and spending time with friends. And it also hinders your career and lifestyle. What else could you be doing with that time? Could you be studying to get a promotion or raise? Could you be organizing your finances? Think about the time spent in front of the TV, and how cutting back could make a difference. Although binge-watching is a new term, binge-drinking has been around for centuries. In certain cultures, especially England (where I'm from), binge-drinking seems to be an accepted part of life. You work hard during the week, then on Friday and Saturday nights you go out and get absolutely hammered. And you can spend a lot of money doing it. The physical effects of binge-drinking are bad enough. Too much alcohol can put a lot of stress on your heart, stop your breathing, affect your memory, or make you vomit in your sleep (many people have died this way). But when drunk, you can do things that have a negative impact on your home life, and your career. It is not uncommon for people to be fired after saying or doing things on a night out that they would never do sober. In this day and age, you could seriously damage your career after a binge-drinking night on the town. Aside from spending large amounts on food and drink, there is another byproduct of shopping for too much grub. Waste. Gluttonous habits in grocery stores can lead to you filling the shopping cart with items you want because they look good. Without sticking to a shopping list, you can easily pile your cart high with items you don't need, and stack them in the pantry and fridge with little hope of eating them before they expire. That is literally cash in the trash. So buy what you need, and what you can freeze — no more. Even if it's a crazy good deal, spending only $5 on a prime piece of steak is not a savings if the steak then expires and goes in the garbage. Most of us love a good bargain. But without self-control, the dazzling deals you see getting served up every day can drain your bank account, and lead to spiraling debt. Remember, deals are only deals if you needed the item in the first place. For example, if you're looking for a new washing machine, and see an ad offering one for 30% off, then congratulations, you found a great deal. But if, at the same time, you see a dishwasher on sale for 30% off, but your current one is just fine, then that's not a bargain. That's just gluttony. You see it. You like it. You want it. You buy it. It doesn't just apply to the big-ticket items, either. Grocery stores use techniques to erode your self-control (like buying 10 items for a $1 each, when you only need two costing $1.50 each). Before you know it, you're over-budget, and stockpiling a lot of items that may never get used. So, before you act, think. Do I need it, or do I just want it because it's on sale? 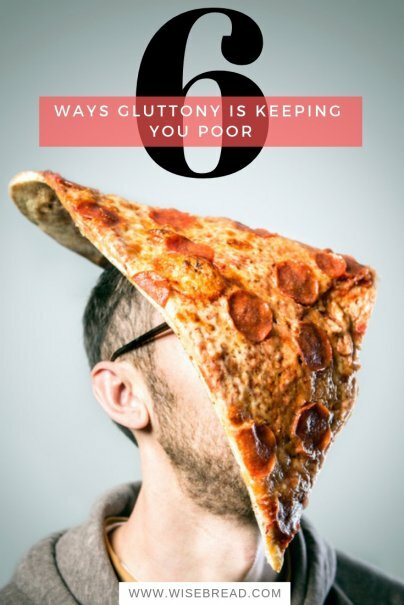 What other gluttonous habits are keeping you poor? Share with us!